This repower was professionally installed and maintained. It is attached to a MerCruiser Bravo ll outdrive. The engine was recently serviced and is ready for this season use. This vessel is also equipped with trim tabs. One house battery and one engine start battery. The battery charger is a Pro Mariner 20. The fuel tank is aluminum and the water and holding tanks are plastic. Starting forward is a V--berth cabin with opening hatch above to add to the already light, airy open atmosphere of a private double cabin with lots of storage with mirror and counter space. Aft is a rather large port side galley featuring a two burner propane cook top, a refrigerator, sink, with plenty of attractive counter space. There is ample storage in lockers and drawers. Ventilation is provided by a opening hatch above. To starboard is a nice saloon table with u-shaped seating with attractive upholstery and converts for sleeping for two. The floors are carpeted. Aft is a sleeping cabin for two with a sliding privacy door. There is plenty of light and storage in this double cabin. To port is a hanging locker and the companionway curved stairs to the helm station and the aft cockpit. The entire cockpit has an enclosure overhead that can be folded out of the way. There is lots of upholstered seating in the helm and and cockpit aft. There is a transom door to the swim step. Access to the engine is from hatches in the aft cockpit. There is also a removable round table for dining in the cockpit. This vessel has just come back from servicing that included new bottom paint and engine maintenance. It is our belief that it is ready now for summer fun. Fuel, food, ice and drinks for an day in the sun or a long weekend in the San Juans. we are not sure of the length of chain or line. It is to be determined. This popular model Sea Ray 290 Sundancer has been re-powered with a larger-than-standard MerCruiser 375 HP. It was installed new in 2008. The boat shows as having been well cared for considering its age. Offered at an attractive price it will make an excellent choice for a family weekend cruiser. Come get this one before it's gone. The fact that it sleeps six, has a large well-equipped galley, the interior is light and airy with two sleeping cabins for four as well as an electric head with shower. 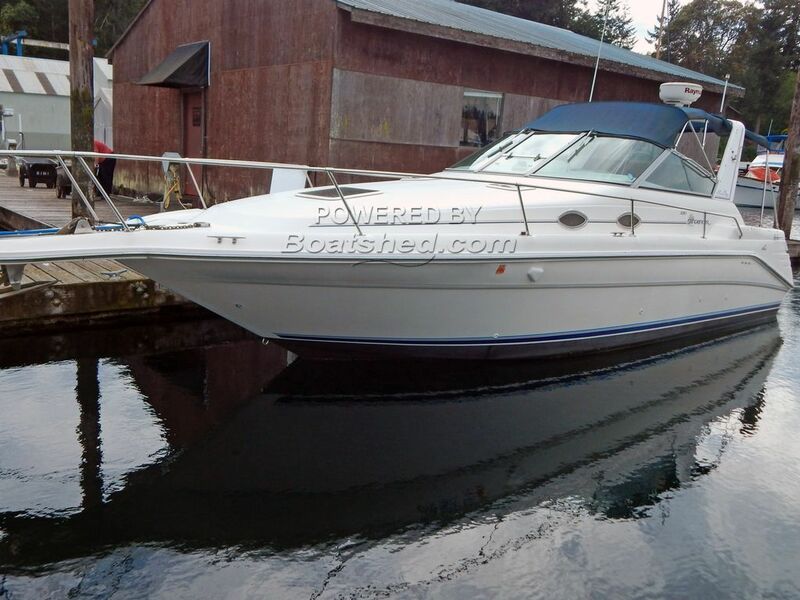 Equipped with adequate electronics featuring Radar and Chart Plotter with a cockpit-helm enclosure makes this an attractive package for a first time boater or someone who wants fun on the water with the capability of long range cruising at an unbelievable entry level price. Call Dave and schedule a showing. This Sea Ray 290 Sundancer has been personally photographed and viewed by David Carleson of Boatshed Seattle. Click here for contact details.